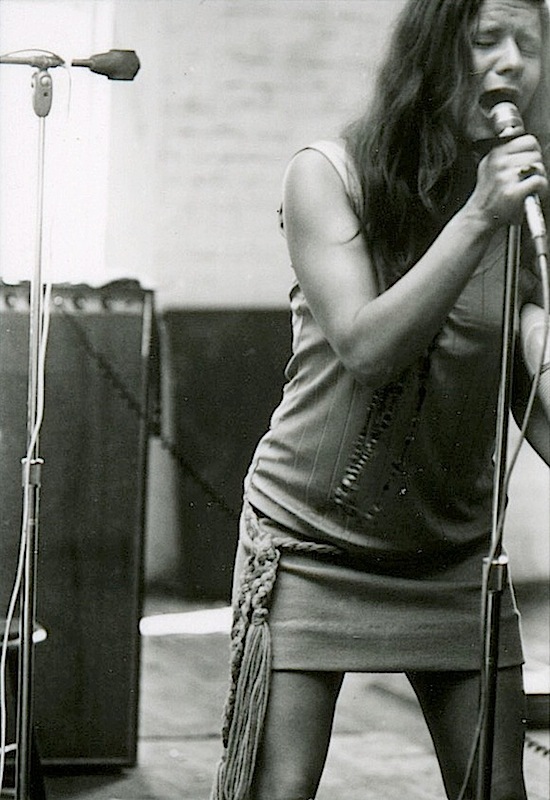 Janis Joplin of Big Brother and the Holding Company at the band's rehearsal space in 1967. 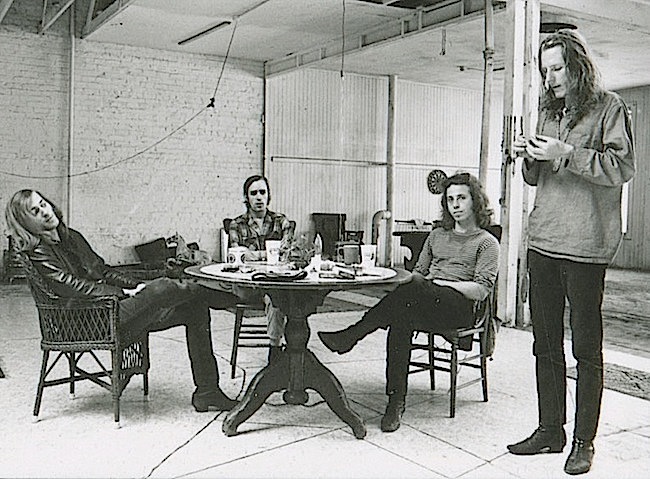 From left: Sam Andrew, Peter Albin, Dave Getz, and James Gurley of Big Brother and the Holding Company, relaxing in the band's rehearsal space in San Francisco. 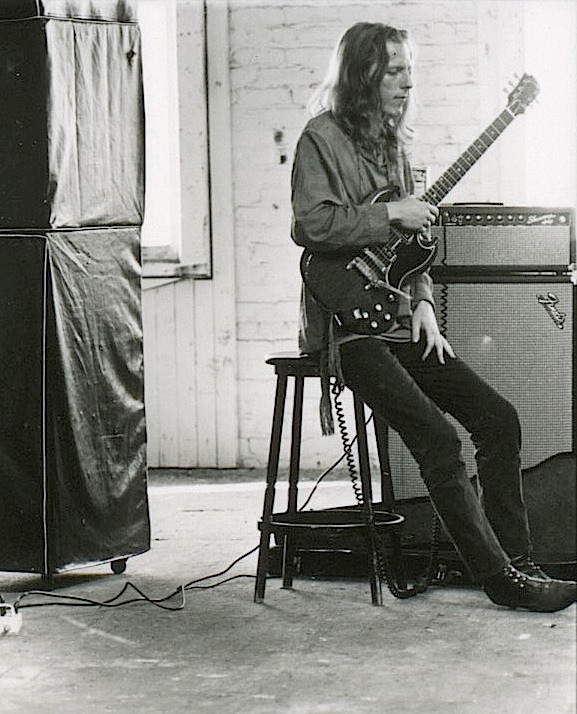 Before Janis Joplin joined the band in June of 1966, lead guitarist James Gurley had been the group's most popular member. During rehearsals, the band would try out new material, iron out problem spots in existing songs, or change arrangements. 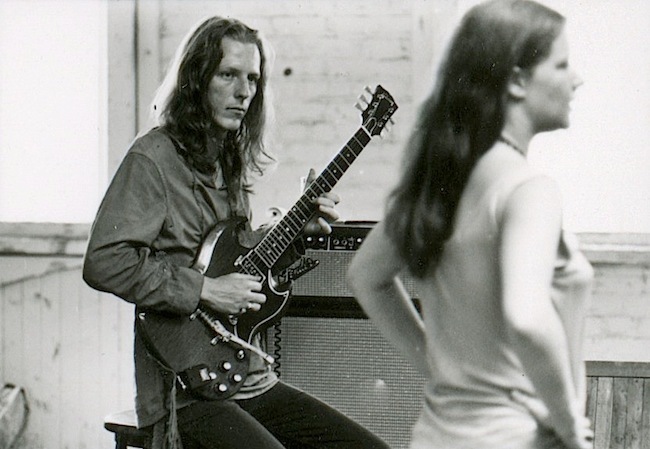 Joplin and Albin during a rehearsal, take one. 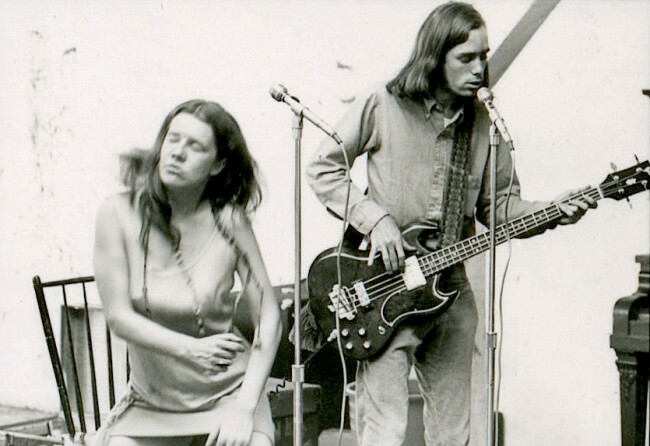 Joplin and Albin during a rehearsal, take two. Joplin and Albin during a rehearsal, take three. 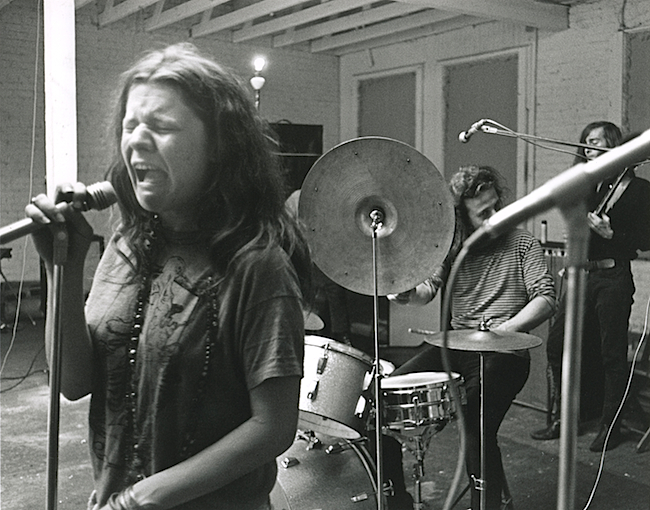 Joplin and Albin during a rehearsal, take four. 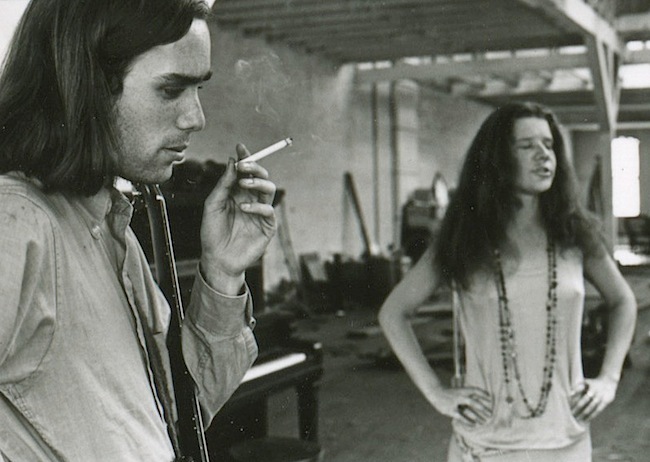 Peter Albin and Janis Joplin listen to a colleague in the band's rehearsal space. Drummer Dave Getz discussing a song's arrangement. Getz explaining a point to his fellow band members. Sam Andrew weighs in while James Gurley looks on. Andrew appears to like what he hears. 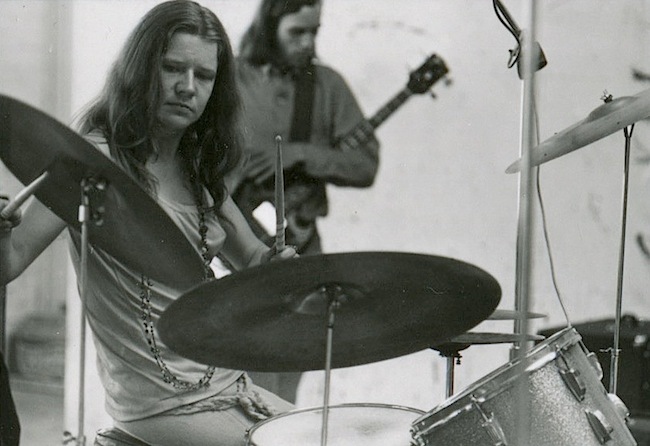 Janis Joplin fooling around on Dave Getz's drum set, take one. 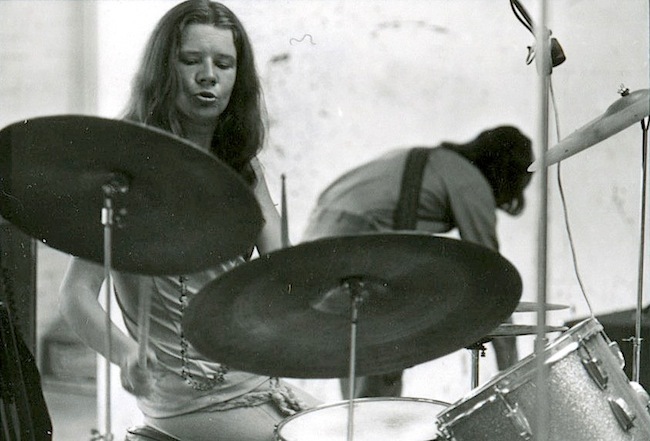 Janis Joplin fooling around on Dave Getz's drum set, take two. 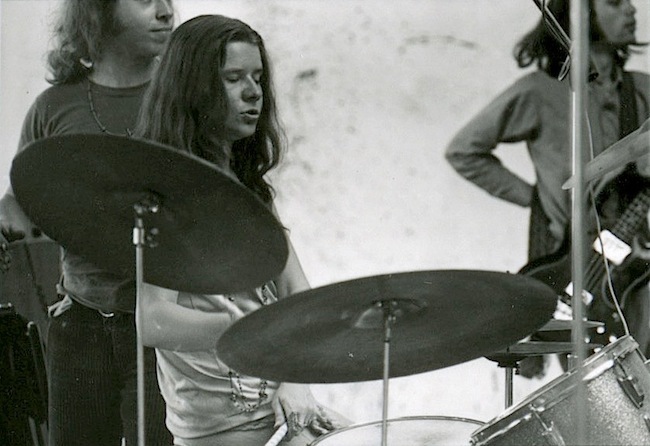 Janis Joplin fooling around on Dave Getz's drum set, take three. Big Brother rehearsing, take one. Big Brother rehearsing, take two. Big Brother rehearsing, take three. Janis Joplin played the guiro on songs such as "Combination of the Two." Joplin playing the guiro, take two. Joplin holding a guiro, take three. 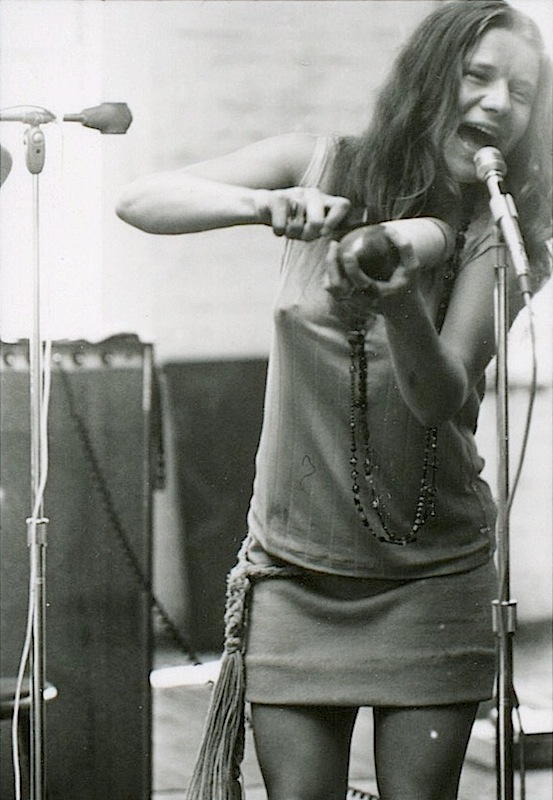 Joplin holding a guiro, take four. Joplin holding a guiro, take five. 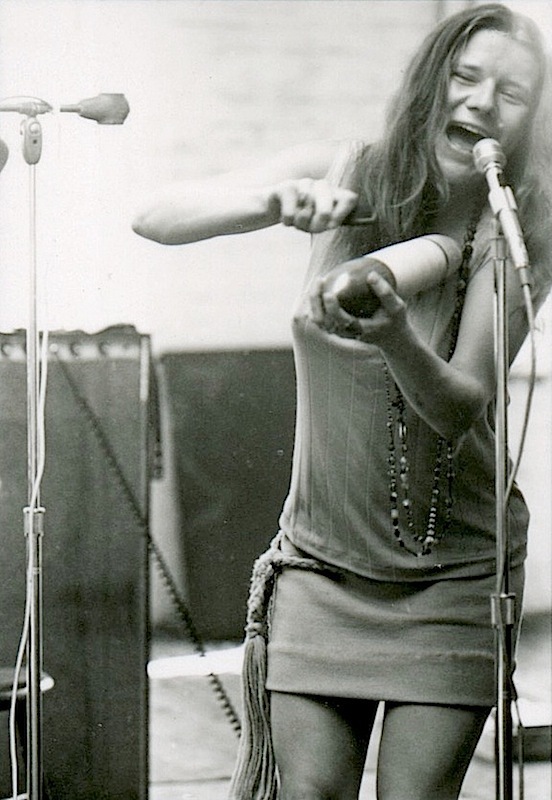 Joplin holding a guiro, take six. A few months from now, millions of Baby Boomers will be seized by the same disorienting flashback, in which they’ll be hurtled through time and space to San Francisco in 1967, at the height of the Summer of Love. The trigger will lurk in the coverage of this alleged cultural watershed by news organizations, magazines, and websites, all of whom will to be tripping over themselves to celebrate the 50th anniversary of what was, in fact, a marketing gimmick designed to capitalize on a scene that was already dead. To avoid taking this bummer of a trip, steer clear of images of doe-eyed young people dressed in their Goodwill finest, blowing soap bubbles and smoking doobies in Golden Pate Park while flashing the peace sign beneath beatific halos of flowers and feathers braided into their long, flowing hair. Here’s the thing, though, that you might not know about the Summer of Love. Turns out that some of those utopian flower children were actually working pretty darned hard at the dawning of the Age of Aquarius. In particular, the bands that gave the psychedelic scene its soundtrack knew what it meant to earn a buck. Take Country Joe and the Fish: In 1967, the quintet played roughly 140 gigs. Jefferson Airplane’s workload was just about the same, while the Grateful Dead logged almost 120 shows. Not bad for a bunch of hippies stoned to the gills on LSD. 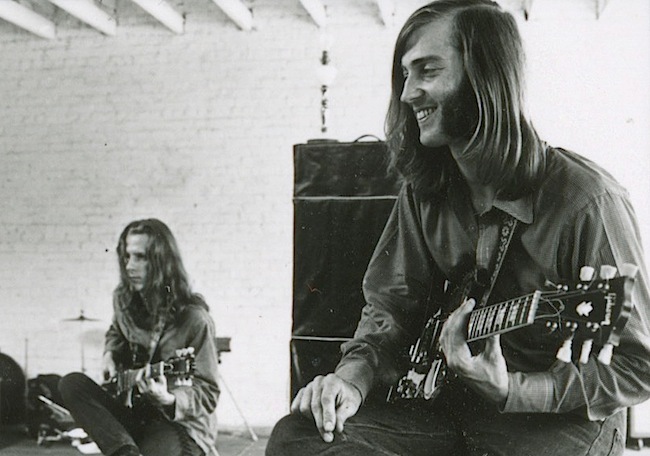 Foremost among these hardworking musicians were the members of Big Brother and the Holding Company, which performed 135 concerts during 1967, occasionally grinding out two or three gigs in a single day. 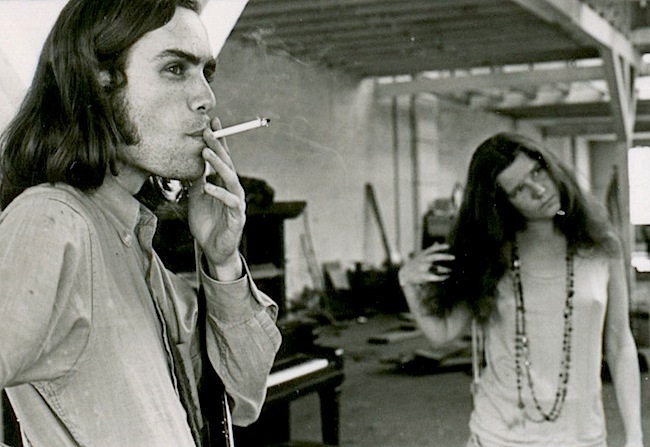 We know this from the unofficial historical record, but also from the photographs taken by the band’s unofficial photographer, Bob Seidemann—many of his candid shots of Big Brother rehearsing in their warehouse on Golden Gate and Van Ness avenues in San Francisco are being published here for the very first time. 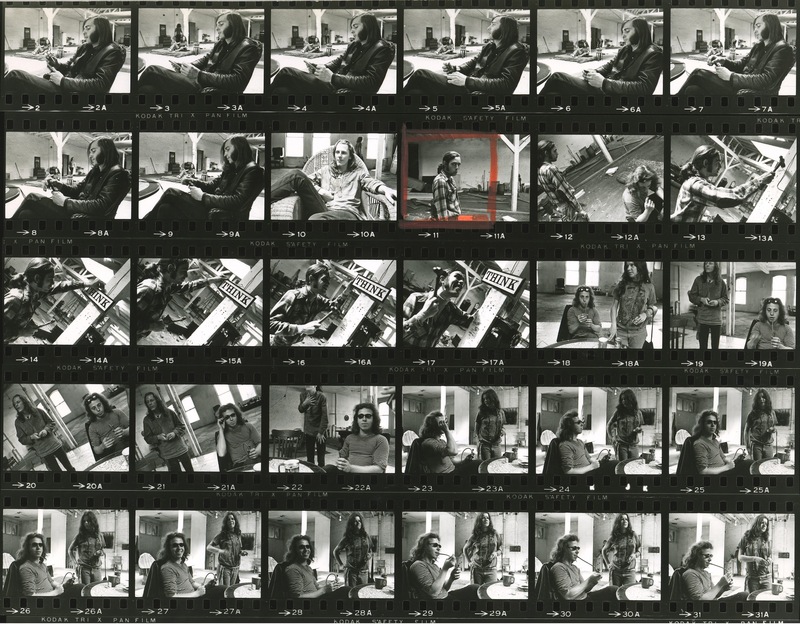 One of dozens of proof sheets of black-and-white photographs taken by the band’s friend and resident photographer, Bob Seidemann. Seidemann would go on to become one of the premier rock photographers of the 1960s and ’70s, creating album covers for Jerry Garcia, Blind Faith, Jackson Browne, and Neil Young. But when he was a part of the extended Big Brother family, Seidemann did most of his work off the clock, snapping his shutter when the mood struck rather than when he had an assignment from a magazine or record company. As a result, Seidemann’s photos of the band during its brief heyday, 1966 through 1968, are a uniquely intimate and complete portfolio, produced at a moment in history when the notion of posterity was not exactly at the forefront of most people’s minds. 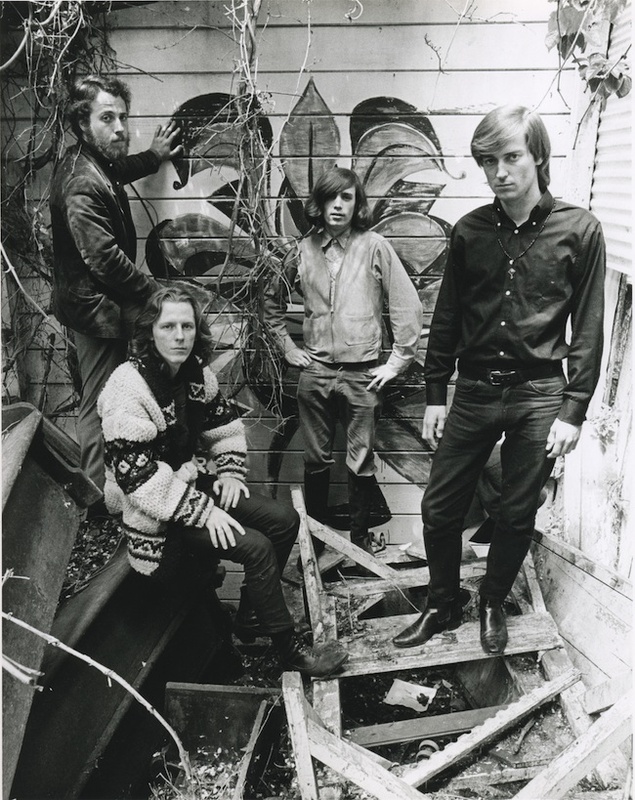 Big Brother and the Holding Company in the spring of 1966 behind the Old Spaghetti Factory, where drummer Dave Getz (far left) worked part time. The seeds of Seidemann’s relationship with Big Brother were planted in 1963, when the New York native, fresh out of high school, moved to San Francisco. Seidemann had been lured west by the hepcat-cool jazz scene in the city’s bohemian-leaning North Beach neighborhood. But after returning to New York for a year or so, and then hightailing it back to San Francisco sometime in late 1965 or early 1966, the aspiring beatnik found himself in a sea of hippies. The “place” was a small club called the Matrix, which hosted the band for a week, from March 1 to March 6, 1966. At the time, Big Brother consisted of guitarists James Gurley and Sam Andrew, bass player Peter Albin, and a drummer—Fritz Kasten began that Matrix run, Norman Mayell finished it, and a few days later Dave Getz joined the band, bringing the game of musical chairs behind the drums to an end. The arrival of Janis Joplin, who would become Big Brother’s lead singer and the most acclaimed female rock star of the late 1960s, was still a few months away. 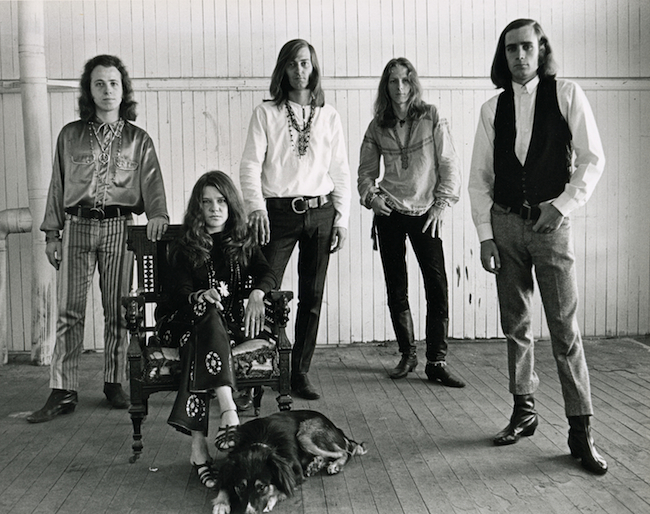 Big Brother and the Holding Company, circa 1967. 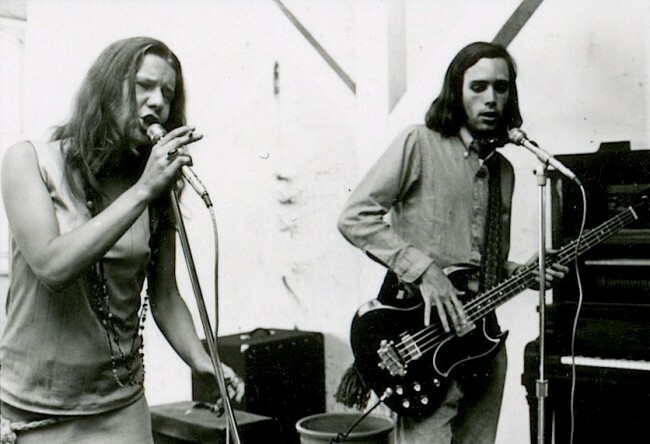 Today, most people who have heard of Big Brother and the Holding Company assume it started out as Janis Joplin’s backup band. 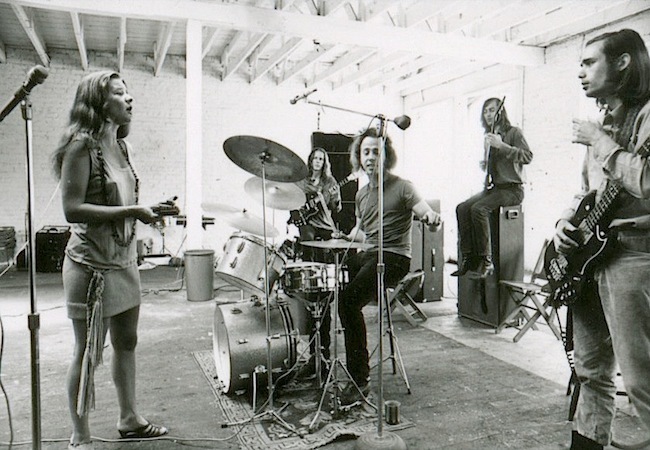 In fact, by the time Joplin took the stage with the rest of Big Brother at the Avalon Ballroom on June 24, 1966, Albin and Andrew had been playing with other musicians as Big Brother and the Holding Company since September of the previous year. 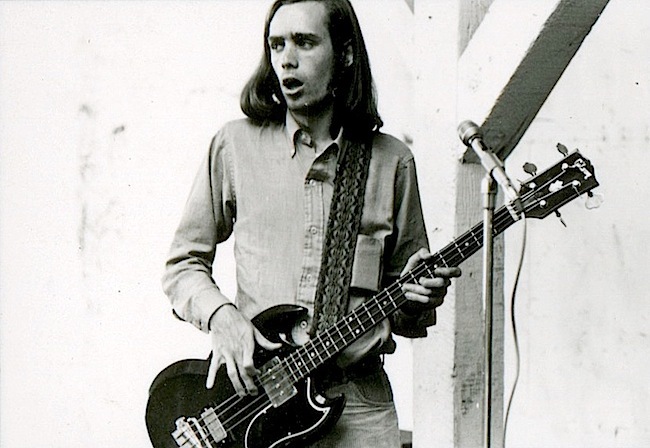 James Gurley joined the band in November of 1965 and Dave Getz followed in March of 1966. During those crucible days, Big Brother was big on experimentation. 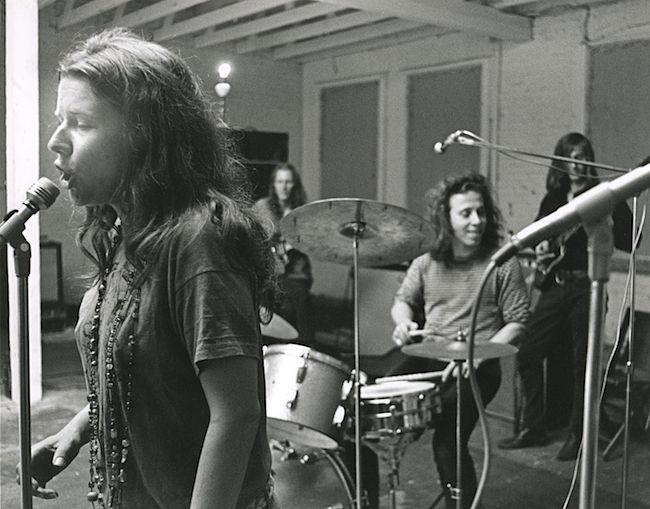 According to James Gurley, who was interviewed before his death in 2009 for Living With the Myth of Janis Joplin: The History of Big Brother & the Holding Company, by Michael Spörke, the band’s early style was highly improvisational, with sets lasting an hour or two, unconstrained by setlists or even the verse-chorus structure of songs. “We were more like a jazz band at that point,” Gurley told Spörke. Janis Joplin arriving for a rehearsal at Big Brother’s warehouse at Golden Gate and Van Ness avenues in San Francisco. 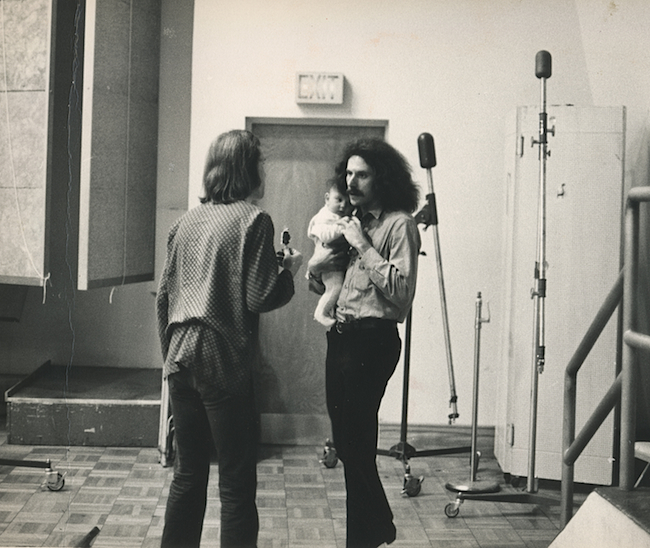 In a photo by Bob Cato, photographer Bob Seidemann is seen holding a band member’s baby while talking with Big Brother’s road manager, David Richards. By necessity, then, the style of the band’s music evolved, shifting from the rapid-fire pace propelled by James Gurley’s lightning-fast fingerpicking on lead guitar to a slower tempo better suited to Joplin’s love of the blues. Sam Andrew (left) and Dave Getz. “We’d go over the setlists and find songs that we were having problems with, or ones we just wanted to change up a little bit,” Albin adds. 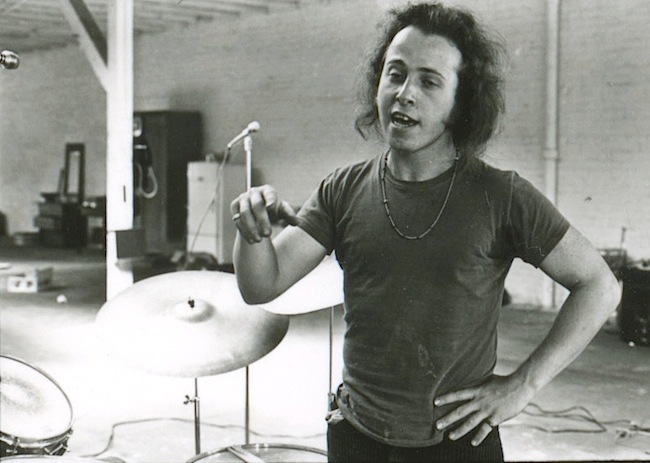 The black-and-white, Kodak Tri X Pan photographs Seidemann took of the band rehearsing in the warehouse appear to be from two different days, identifiable because of the change in clothes worn by band members. Joplin’s garb is easiest to describe. In one group of photographs, she’s wearing a T-shirt with the JOB cigarette-papers woman on it. This was probably not a random choice on her part—the image had been popularized by artists Alton Kelley and Stanley Mouse on a poster for a Big Brother show dated October, 7, 1966, at the Avalon Ballroom. The rest of Joplin’s attire—pin-striped jeans tied at the waist by a braided belt, a pair of kitten-heeled sandals beneath her feet—is defiantly casual, which is surprising since these photographs were definitely taken after Big Brother’s triumphant performances at the Monterey Pop Festival in June of 1967, which means Joplin was on her way to being a full-fledged rock star, and all the wretched excess that implies. The poster behind Joplin’s head is for a Steve Miller concert in September of 1967, which helps date this photo to the fall of 1967. How do we know? 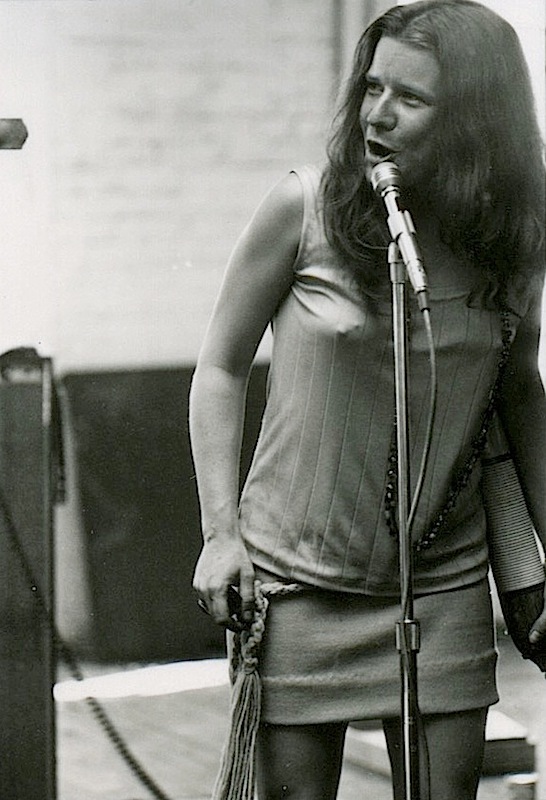 Well, in one sequence of photographs, in which Joplin is practicing the maracas with Getz and Andrew, there’s a poster tacked to a wooden post advertising shows by Steve Miller and Little Richard at the Straight Theater on Haight Street. Those shows took place in mid-September of 1967: Since it’s unlikely this poster was produced more than a week or so before those performances, that pegs these rehearsal photos of the band to September of 1967, or later. It’s not clear if the second set of rehearsal photographs were shot before or after the other group, but the Steve Miller poster is not on the post. That fact doesn’t prove this rehearsal occurred earlier than the other, but it at least suggests that it might have been the case. 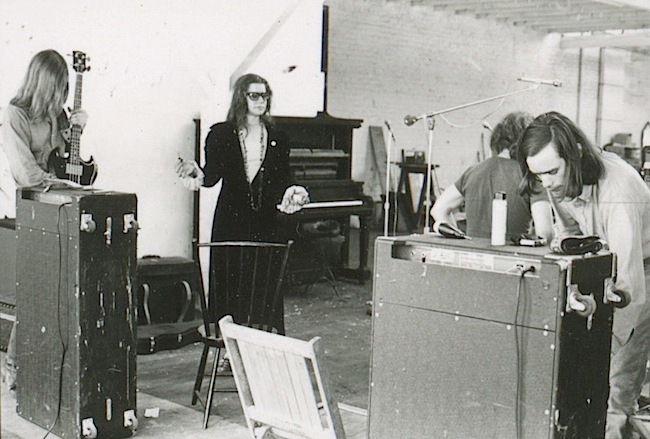 At any rate, Joplin is a bit more glam for this rehearsal, arriving in sunglasses and a dark overcoat covering a short skirt and matching top, although with the same braided belt around her waist and sandals on her feet. Perhaps Joplin had dressed up a bit in preparation for Monterey Pop, or maybe she was seeing what it would be like to move around in this outfit ahead of several shows scheduled later in the year at the Whisky-A-Go-Go in Los Angeles? Speculate away. 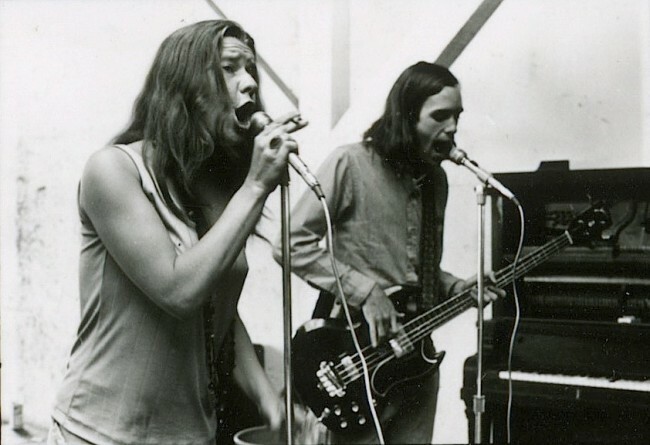 Joplin’s last show with the band was on December 1 at the Avalon Ballroom, where she had made her Big Brother debut; less than two years later, she died of a heroin overdose. 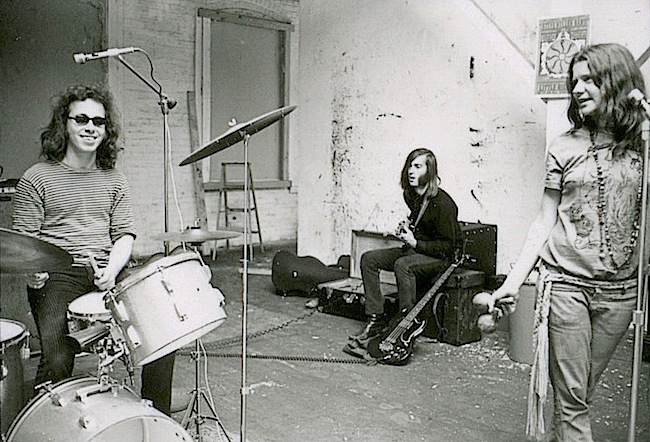 But Joplin and the band would live on in the photographs Seidemann had taken of them for a publisher called Berkeley Bonaparte. The resulting posters of Seidemann’s friends sold briskly at head shops around the United States. At the time, they helped define the look expected of would-be hippies heading to San Francisco to participate in the Summer of Love. Bob Seidemann’s posters for Berkeley Bonaparte made Big Brother and the Holding Company one of the most iconic rock bands of the Summer of Love. 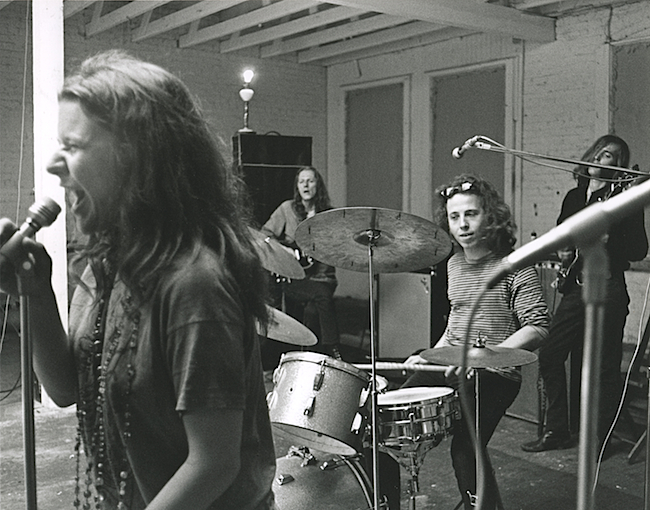 From left: James Gurley, Dave Getz, Janis Joplin. For his poster, titled “Mutant,” Getz stood silhouetted in a crooked doorway. For that shot, Getz says, “we went out to the Lawrence Lab in Livermore. Somehow Bob knew about that room with that strange door opening.” On the other side of the doorway was a collage created by Seidemann of a burning Buddhist monk, an exploding hydrogen bomb, and Albert Einstein’s eye, references, no doubt, to a few of the more serious issues on people’s minds during the late 1960s. 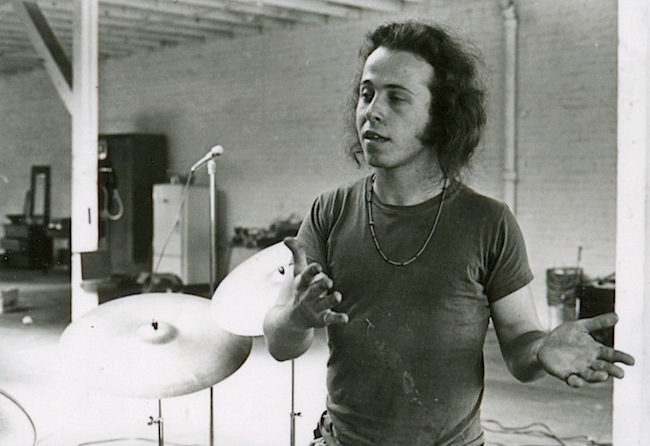 The rehearsal space at the warehouse, in contrast, was a sanctuary from the hippie hype and marketing machinery that, ironically, was using Seidemann’s posters to lure tens of thousands of kids to San Francisco for the Summer of Love. 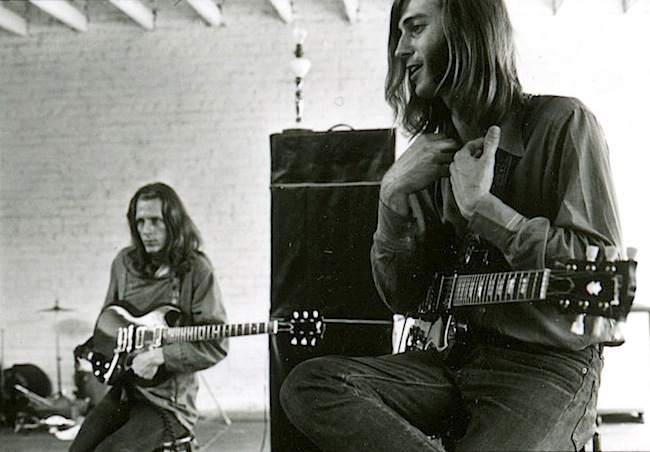 It was a place where four musicians and a singer could spend a few hours going to work as Big Brother and the Holding Company when no one was watching. In Living With the Myth of Janis Joplin, Seidemann describes Big Brother as “an organic, natural phenomenon, which grew like a plant from the soil. 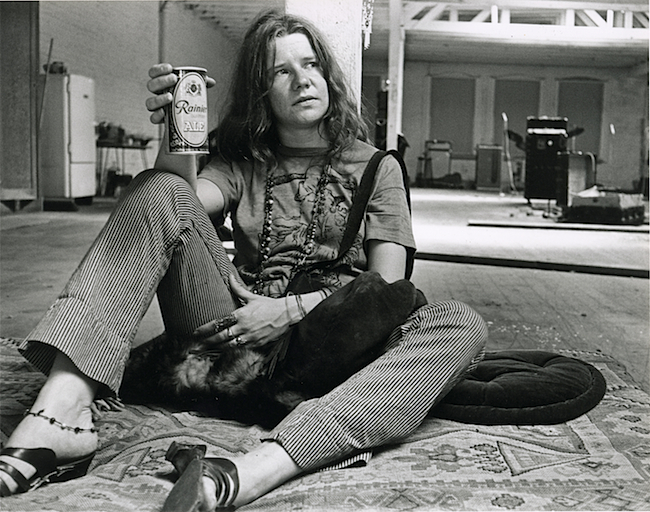 Janis Joplin became their flower.” In this light, the warehouse on Golden Gate and Van Ness was their garden. Fascinating reading … always great to see more info about this legendary band. That’s my big brother. I was there for the early 1967 scene, just before I was drafted into the Army. Changed my life in ways that still reverberate to this day , at 73 years of age. What a scene, thanks to my big brother. 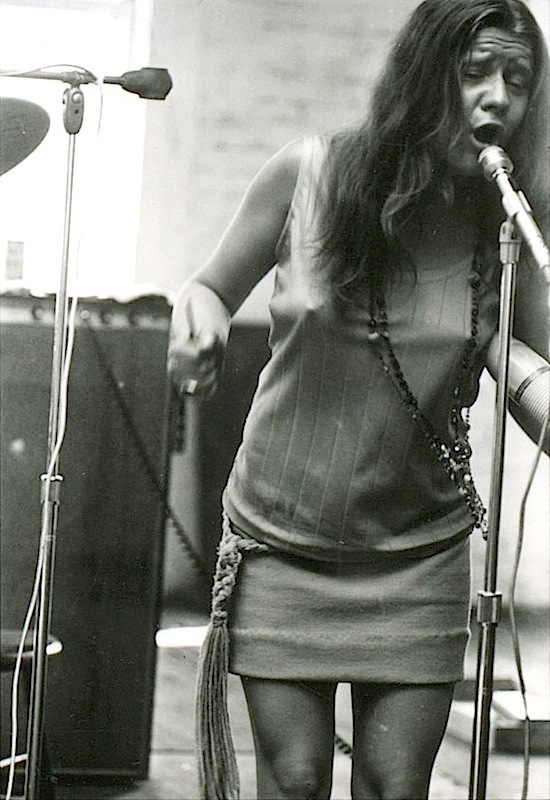 As a huge Janis fan – a little Flower Child myself in a “happening” uni in the late 60s, I adored her abandon and passion. Yes, her voice was gritty and raw and unrefined, but the amount of emotion and transparency expressed what I felt. Completely exemplified the radical newness, openness, and excess of the era. I’m still so sorry she’s gone. Another absolutely wonderful article! Thanks for keeping the spirit alive. Later, mom said, “I miss Janis.” I imagine, like all of us, she missed those heady days – sewing psychedic clothes and Nehru jackets for me and my friends, making watermelon seed necklaces, wallpaper beads. I went on to try many of the materials available back then, went into a decline, sober and clean now for 32 years. I survived – I sure wish Janis, Jim and Jimi did. Thanks for posting all of these great photos and article. Thank you for an informative article and some rare photographs of the band. I saw Big Brother with Janis at Winterland and the Fillmore, and I would have liked to see and hear the band before she joined. 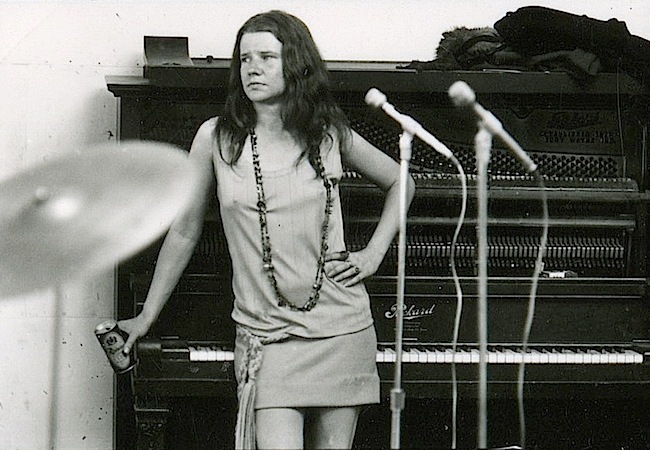 Janis didn’t seem to have a sense of loyalty towards the band that allowed her to finally hit pay dirt, because she left Big Brother to launch a solo career that didn’t get very far. She’s remembered today because of what she did with BB. 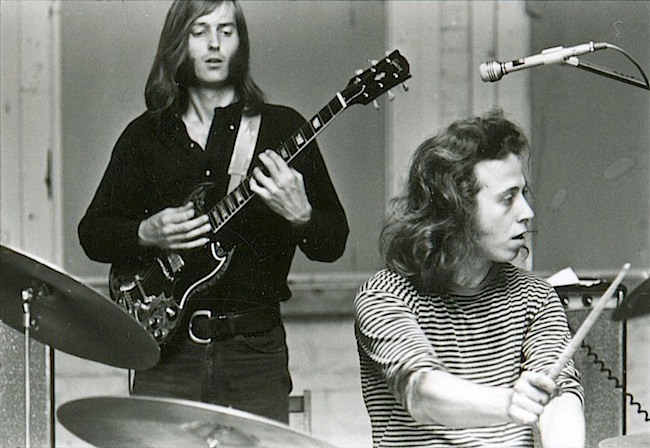 Excellent article on Big Brother & The Holding Company, and photographer Bob Seideman. A very important point was raised on how hard working all the San Francisco bands were. However the author neglected to mention the Quicksilver Messenger Service, who often shared the same stage with the other bands mentioned. Just for the record, in 1967 Quicksilver Messenger Service performed 127 concerts. Often performing in the afternoon at one location, and elsewhere in the evening. Thanks again, enjoyed the article. What wonderful and hard to find photography. I have had the privilege of seeing his project ”Airplane as art”, it is one of the most beautiful portfolios I have had the pleasure to view, so sorry he passed away. This is a great read and such beautiful photography. 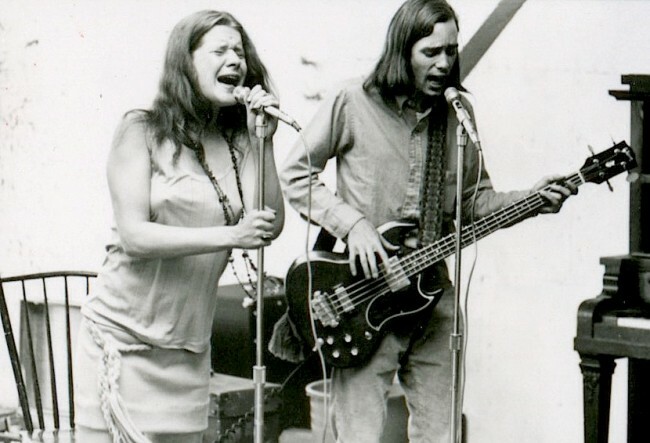 My father traveled across country with Chet Helms of the Avalon Ballroom to Texas where they picked up Janis Joplin and brought her to San Francisco. I believe it was the first time she left for CA. She was a singer who got her chops in the church choir and, though he had a crush on her immediately upon meeting her in Texas, she turned him down in favor of the man who won the local pig calling contest. My dad headed back east to Boston and then on to Nantucket to rebuild the wharves in 1968 before I was born. I think this was one of my father’s last big journeys of his youth, siphoning has from tractors along the way. He told this story with pride and never a bit of regret. He lost touch with Chet and the San Francisco crew after his return as his CO status kept him working at a local VA hospital. My father was more of a beat than a hippie, 25 years old in 1967, a jazz sax player living in Roxbury and a trained painter at the Museum School in Boston. I wonder if he met Seidemann in his travels? At any rate, I enjoyed the article and saw some of the memorabelia from these years at the SF Jewish Museum’s show on Bill Graham a couple of years back. Thank you for this glimpse into the rehearsal space and into this time. First time on your site (from Laphap’s Quarterly referral) Thanks for the memories of Big Brother & Janis J. we sure miss her!